KJIPUKTUK (Halifax) – Halifax has the 7th highest poverty rate among Canadian cities, only slightly lower than Toronto and Vancouver. Poverty rates among immigrant children and visible minority children are particularly high. These are some of the grim facts in a new report published by the Nova Scotia chapter of the Canadian Centre for Policy Alternatives (CCPA), written by Christine Saulnier and Katherine Ryan. The report with its focus on HRM is a supplement to the CCPA’s 2017 Report Card on Child and Family Poverty in Nova Scotia. The report uses mostly Statistics Canada 2016 (2015) census data. As of 2015, 18.8% of children in Halifax (Census Metropolitan Area) live in low-income households. But within these numbers there are huge variations, depending on community and demographic background. 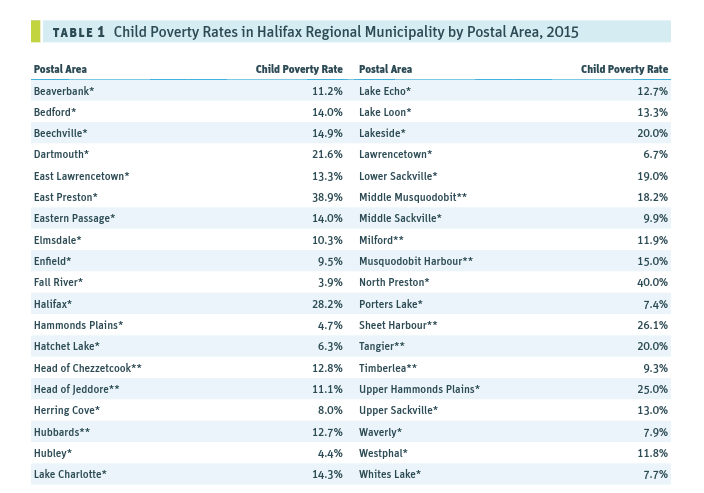 Mapping child poverty rates to a neighborhood level the new report reveals some startling differences among HRM communities, both urban and rural. For instance, the African Nova Scotian communities of North Preston and East Preston have child poverty rates of 40% and 38.9% respectively, while suburban Fall River clocks in at a mere 3.9%. Within urban Halifax the differences between neighbourhoods are equally striking. The highest rate of child poverty is in the Spryfield area at 40%. North Dartmouth/…/Crichton Park area of Dartmouth had the second highest rate (37.3%) followed closely by North End Peninsula (35.0%). The lowest rates are in the South End Peninsula (14.4%) and Bedford (14.8%). Children of immigrants and children of visible minority status experience extremely high poverty rates. The child poverty rate for immigrant children in Halifax was 43.3% in 2015, meaning that more than two in five children experience child poverty. The child poverty rate for children of visible minority status is 37.8% in Halifax compared to 14.4% for non-visible minorities. The Canadian rate for visible minorities (24.6%) is considerably lower. The highest rates of child poverty are experience by Arab children, with two-thirds at or below the poverty threshold. This category includes the Syrian refugees that arrived in the province up to May 2016, which may partially account for the high rate of poverty, the report suggests. And as we reported last month African Nova Scotians in general face much higher rates of poverty and unemployment, and this of course is reflected in child poverty statistics as well. Kelly Regan, the minister of Community Services, told Cape Breton Post reporter Nancy King in November that 2015 child poverty rates, also very high in Cape Breton, would likely improve as a result of the Canadian Child Benefit, a federal program implemented this summer. Others have countered that although undoubtedly beneficial, it falls far short from solving child poverty. Regan also mentioned that the department tracks income assistance recipients and it knows that the caseload is declining. How the minister can possibly consider that to be good news given that poverty rates have only marginally decreased is puzzling. Rather than wait for federal programs to provide some relief and actively push people off welfare rolls the department should look for measures that address structural child poverty in Nova Scotia. The CCPA report offers up several measures that will reduce child poverty in a more fundamental way. “Poverty is first and foremost about a lack of income. People living in the deepest poverty require more income support,” the report suggests, highlighting the obvious need to raise welfare rates in such a way that parents and their children can live a life in relative dignity. Download Child and family poverty in Halifax. with my own little family years ago I appreciate the summary words ”…can live a life in relative dignity”…Thank you for continuing to fight for compassion, justice and dignity for all.